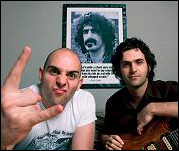 LONDON (CelebrityAccess MediaWire) –Ahmet and Dweezil Zappa, Frank Zappa's sons will be performing the music of Frank Zappa during a major 2005 European tour billed "Zappa Plays Zappa – Tour De Frank". The 19-date tour sees the first authorised presentation of Frank Zappa Music by the Zappa Estate since the composer himself departed for his final tour in 1993. Reportedly no two concerts will include the same set list. Due to the wealth of Zappa's material, the new band will perform a different selection of songs every night. Joined by surprise special guest musicians who have performed with Frank throughout his career, the message of this European tour is to expect the unexpected.